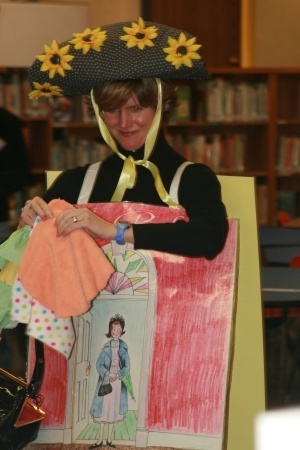 The Bookwalk is a fashion show for books, designed to pique the interest of 3rd grade children. Guild members don sandwich boards and costume accessories while a brief description of each book is shared. New books are then donated to each school’s library. This year, the Storytelling Guild visited 19 Jackson County schools to share this unique program. The Bookwalk program is typically held in January. "Perhaps you’ll see some books you know. I hope a few are new. Enjoy our bookish fashion show..."
"Thank you so much for allowing our school to participate in Bookwalk. Our third graders thoroughly enjoyed it. 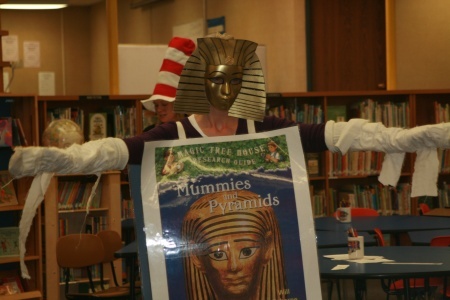 What a great way to get kids interested in reading! Almost all of the books I put on display from your list were checked out after the program. Also, thank you for the bookmarks & the two books. I already have requests for them as soon as I process them into the library! 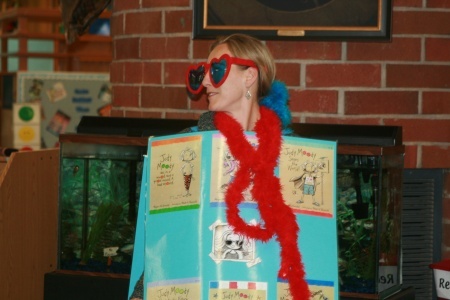 We are looking forward to Bookwalk again next year!" Please join us in thanking the Rotary Club of Ashland Lithia Springs Foundation for their generous donation of a Kids First Rotary Grant to the Storytelling Guild. These funds were used to enhance our Bookwalk program through the donation of additional chapter books to each grade school library we visited throughout Jackson County. We were also able to give new polish to our presentation by replacing old sandwich boards and purchasing new props. - Thank you!